Beautifully situated between the Ardeches, the Mediterranean Sea, the Provence and the Cévennes, the LUX-camp Le Domaine de Gaujac is perfectly placed to provide campers with a luxury camping holiday experience that allows them to explore a large part of France during their break. Leafy green, secluded mobile home pitches offer relaxation and privacy, for the site is surrounded by open fields and woods, where neighbours are squirrels and butterflies, not noisy fellow campers with an intrusive interest in everyone else's camping arrangements! Why visit Domaine de Gaujac? Located in a traffic-free environment, this luxurious holiday camping site allows parents with children to feel their little ones are safe. Large, shady pitches with comfortable and spacious mobile homes that are well fitted out offer all holidaymakers total relaxation in the warm Cévennes climate. 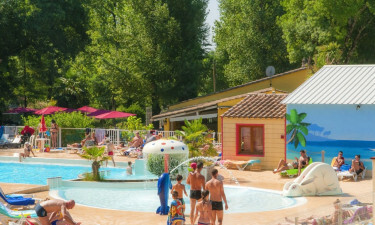 This luxury holiday camp is situated by the river bank of the Gardon d'Anduze, within a short walk of the amenities in the village of Anduze. Visitors should note that this is a purely French-speaking family holiday camp - a good place for all to practice newly acquired language skills! Guests can hire cricket bats, golf clubs, games, boules and other sporting equipment for a small, refundable deposit. 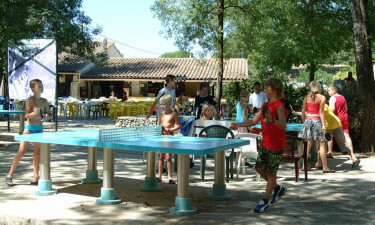 There are also a tennis court, minigolf course and agility circuit, a water park with paddling pool, water slides and heated swimming pool and nearby Parc National des Cévennes for cycling, hiking, wildlife spotting and walking excursions to look forward to! This fun-packed Lux-camp in France also features a volleyball court and football field, a basketball area, four table tennis tables, billiards, four children's bouncy castles and kiddies' mini-club entertainments, dance and crafts lessons, karaoke and lotto evenings, cinema and dance nights, meals with cabaret, not forgetting charming river walks with their pooches, for the luxury camping site permits dogs. Camping luxury naturally includes an onsite restaurant and snack bar with a wide selection of meals that will appeal to all ages. 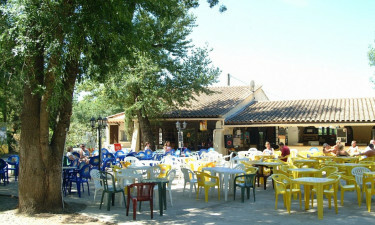 Predominantly frequented by French campers, the standard of eating out at Domaine de Gaujac is naturally high. The bar and snack bar also offer pizza, grilled meat and salads for smaller appetites. During peak season, themed meals are provided once a week. A fully-supplied onsite supermarket and freshly baked bread outlet allow campers to feel their camping holiday provides them with a home from home. Campers can also purchase postcards and stamps onsite for those all-important messages home to friends, colleagues and family members. Does that sound like luxury camping you'd enjoy? 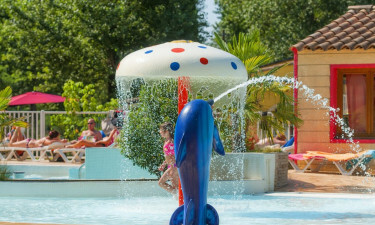 Then be sure to book your mobile home holiday at LUX-camp Domaine de Gaujac!